From upmarket Land Rover to art exhibit in the Louvre, from storming off-roader to luxury executive transport, the Range Rover has done it all. The Range Rover inspired a new breed of 'leisure' vehicles, seeking to emulate its mix of on-road comfort and off-road prowess, and it was the vehicle that paved the way for Rover's return to the USA. The basic profile barely changed during 26 years of production, thus keeping models of all years popular. Its strength, bolt-together structure and availability of spare parts make it the ideal vehicle to acquire and restore, and its reputation as a rugged workhorse ensures that the first generation Range Rover will be popular for many years to come. - Updated to include details of all first generation Range Rovers from 1970 to 1996. - Range Rover heritage and 'milestones'. - Buying a Range Rover and what to look for. - Full V8 strip-down and rebuild with tuning hints and tips. - LPG engine conversions. - Suspension replacement and upgrade. - Replacing and uprating interior trim and fitting accessories. - Painting, filling and aluminium welding techniques. 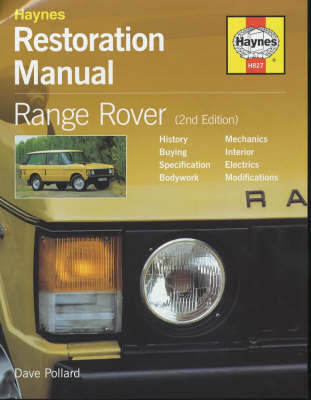 - A 2nd edition of the popular Range Rover Restoration Manual from the best-selling series of titles including Land Rover Series I, II and III, Land Rover 90, 110 and Defender, MG Midget, MGB, Mini, Porsche 911, VW Beetle and VW Golf.